Good Saturday morning! Just a few forecast notes for you, as we begin this soggy final weekend of Autumn. --The trajectory of our weekend storm system has notably shifted south. That means much of New Jersey will not experience a total washout on Saturday. There will still be periodic rainfall throughout the day, especially across the southern half of the state. Northern and central New Jersey may actually experience a mostly dry day — although still cloudy, dreary, and occasionally damp. --Sunday actually looks to be the wetter day of the weekend now, particularly stormy from early morning to midday. Rainfall totals by the end of the weekend are still expected to range from 1 to 2 inches. --Flooding along roadways, rivers, streams, and creeks is possible from heavy rainfall. As of this writing, no watches, warnings, or advisories have been issued for New Jersey. --Widespread 50s are still expected for Saturday — that's about 5 to 10 degrees above normal for mid-December. The cooldown kicks in Sunday, with highs only in the 40s. --A bit of wintry mix is possible in the higher elevations of NW NJ at two points during the weekend. (I'm mainly talking about that usual "cold zone" north of I-78 and west of I-287.) First, freezing rain may significantly slicken up cold surfaces from Saturday night through Sunday morning. Second, snow showers will be possible at the very tail-end of this system, from Sunday night into Monday morning. 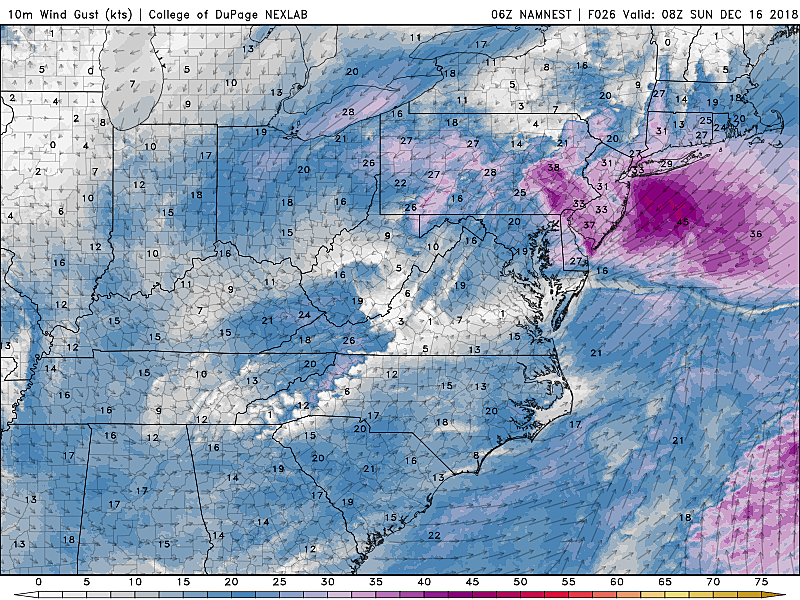 --The wind will become increasingly gusty as the weekend presses on. Saturday will start breezy, with some noticeable gusts to 30 mph by the evening hours. Winds on Sunday will be even stronger, gusting to 40+ mph through the first half of the day. Sporadic power outages are possible. --Coastal flooding is still a marginal concern, given that fierce on-shore wind. I'm still seeing about a foot of surge on the tidal models, which is enough to cause minor inundation issues — a.k.a "the usual spots" along tidal waterways could see some flooding. --The long-range forecast shows cold and blustery conditions for Monday and Tuesday, and then a generally quiet week. Our next threat for a storm system would be Friday, the first day of Winter. Stay safe, stay dry, and have a great weekend!